All contributors can add help items or add to existing help items. If you find something is not clear, and there is no help item, please feel free to add a help item. 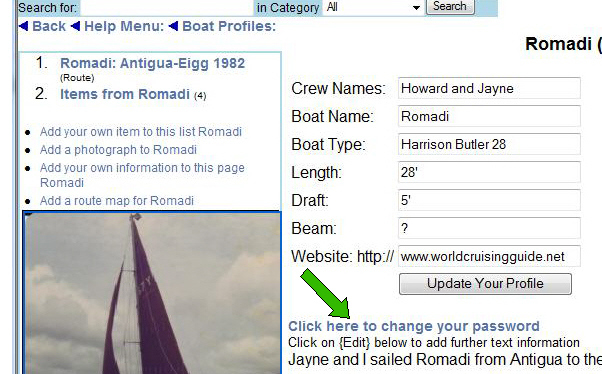 Then in your boat's profile screen, click on the "change your password" link (shown by the green arrow below) . This link will only appear on your profile page, and only when you are logged in. 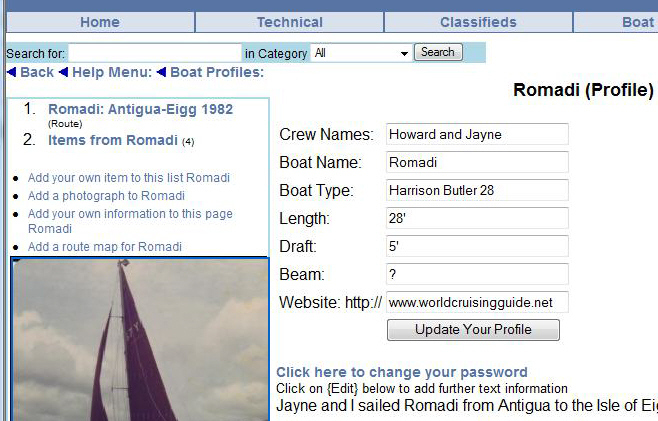 To edit your own profile and add information about your boat, login, and then click on Boat Profiles. You can the add information and text and pictures about your boat and yourselves, and change your password if necessary. You can also add a link to your own website by filling in the URL. Sorry, is it possible tout write in Frances? because my english is very poor. 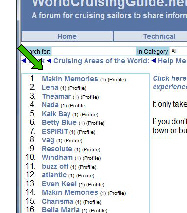 WorldCruisingGuide.net is a worldwide, international website for sharing information between cruising sailors of all languages and nationalities. We welcome information in any language. If neccessary, we can always use Google translate to read the information you provide. I will try and get back to you as soon as possible. You can make temporary changes in zoom or position to the map at any time, but the changes will not be saved unless you first click Click here to modify this map below the map. Then, after making your changes click the Save to Database button to make the changes permanent for all future viewers of that page. If you submit many articles to this site, or any other internet explorer site,such as Hotmail, and your spelling is as bad as mine, you may want to download ieSpell from iespell.com. It is a free program that checks spelling on any text you type in internet explorer, and works just like any other spell check in Microsoft Outlook or Microsoft Office. 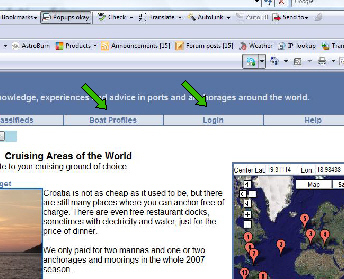 Once installed, ieSpell shows up in the Internet Explorer Tools menu. Go to www.iespell.com to download the program. You can change the zoom in and out on the map by clicking the "+" or "-" sign in the top left corner of the map. You can try it on the map right now. This would just be a temporary change, and when you come back to that page it will have reverted to it's original zoom level. If you are registered and logged in, it is possible to make permanent changes to the way the map appears on that page for everyone. Click on the link at the bottom of the map where is says "Click here to modify this map. You can then zoom in or out and click "Save to database" to save that view to the database. You can experiment all you want on the map on this page. The keystrokes to type a € symbol on a US type keyboard are ALT + 0128, using the number pad for the digits. On my toshiba and gateway laptops you need to push the "Fn" (Function key) to activate the number pad in the middle of the keyboard with green numbers(under the 7, 8 and 9 keys). So you need to hold down the Fn+Alt and then type 0128 on the green numbers. To drag the map, left click on the map and move the mouse while holding down the left mouse button. You should see the "little hand" cursor close as it grabs hold of the map and open as you release the button (doesn't always open but what can we do:-). Move the map to center over the required position. The Center Latitude and Longitude boxes above the map will change when you release the map. Try it now on the map to the right. You can also click on the left, right or up and down arrows to pan the map, but it is easier to drag the map as described above. Adding your own information to the site. Make sure you are on the appropriate page first. In other words, to add the port of Antibes, make sure that you are in the French Riviera page first, because Antibes is part of the French Riviera. Or, if you want to add an anchorage in the port of Portimao, make sure that you are in the Portimao page first. Likewise, if you want to add a whole new article on SSB radio, first go to the SSB radio page. Don't worry if the page shows up in the wrong place, we can sort it out later. You will need to select a category while creating your page. Try to use existing categories first, but you can create a new category if needed. If in doubt, 'Region or Place' is the default category which you can use for anything. We can fix that later too. The title of your new page will appear in the menu list on the left hand side of the parent page. Your new page will have a new map. You can zoom, pan or customize the map to best show the location of the feature that you are describing. If you don't want a map on the page you will be able to turn it off later, by going to "Modify this map" after you have created the new page.